The enduring cliche that darkness is deepest just before dawn may be just that: a cliche. Nevertheless, it contains a grain of truth. And I wouldn’t wish to go back to the situation I found myself in just over three years ago – slumped on a Berlin pavement, contemplating ways and means to end my life. I was wracked with shame, and conflicted on the one side by a suffocating despair, and on the other by a permanent current of electric fear. Nor would I wish it on anyone else. But coming through a ‘nervous breakdown’, a burnout, a period of intense suicidal ideation, and what’s technically known as a major depressive episode has shown me that there’s light, meaning and positivity in the world. 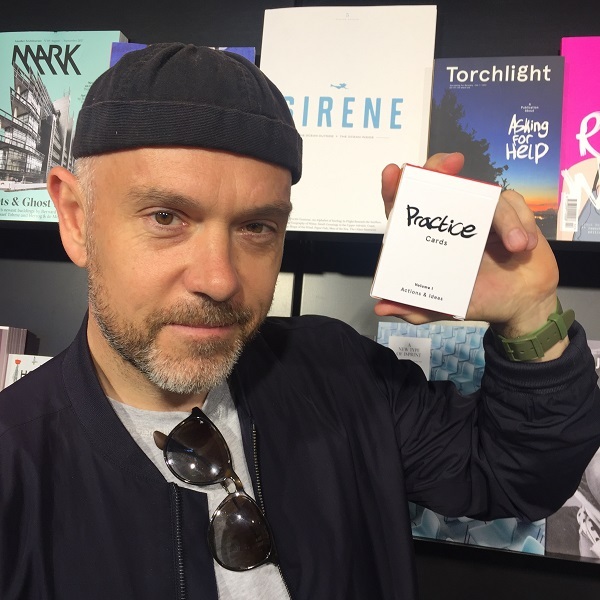 I lived in Berlin five years, working there initially as a freelance writer and latterly as editor of an arty fashion magazine. This whirlpool of depression and anxiety (to give these experiences their diagnostic names) slowly and imperceptibly, and in the end very rapidly, dragged me towards the brink of suicide. But I found something else that’s sustained me ever since, and which I’ve been infusing into a project designed to assist others. It was a message from a remote, almost unknown part of my mind, which said, ‘ask for help’. So, after some time on that Sunday in 2014, I did. I wrote a message on Facebook, and people came for me; friends, and people I never knew were friends. They took me to psychiatric hospital and I began a long, slow recovery process, piecing the parts of my life and psyche back together. Experiences like this are, sadly, all too common today. Suicide is now the leading single killer of men under the age of 45, mental illness is soaring among the young, and one in four us will experience a mental health issue this year. But, as painful as breakdown, recovery, depression and anxiety can be, they can lead to positive changes. Pain can be transformed into other things: beauty, meaning, energy, and ways to help others. Earlier this year I published a memoir of my experiences: Torchlight: A Publication About Asking For Help. Something like a book, something like a magazine. Writing my story down helped me process my experiences, but I always sensed that publishing them would also help others to know that they’re not alone when they’re suffering. Moreover, that talking openly about mental illness can remove much of its frightening power. Stigmas tend to collapse when they are addressed directly. I’d wanted Torchlight to be both beautiful and useful to others, and to emphasise the message that it’s OK to ask for help. Something else came out of my episode too – a directly useful tool. 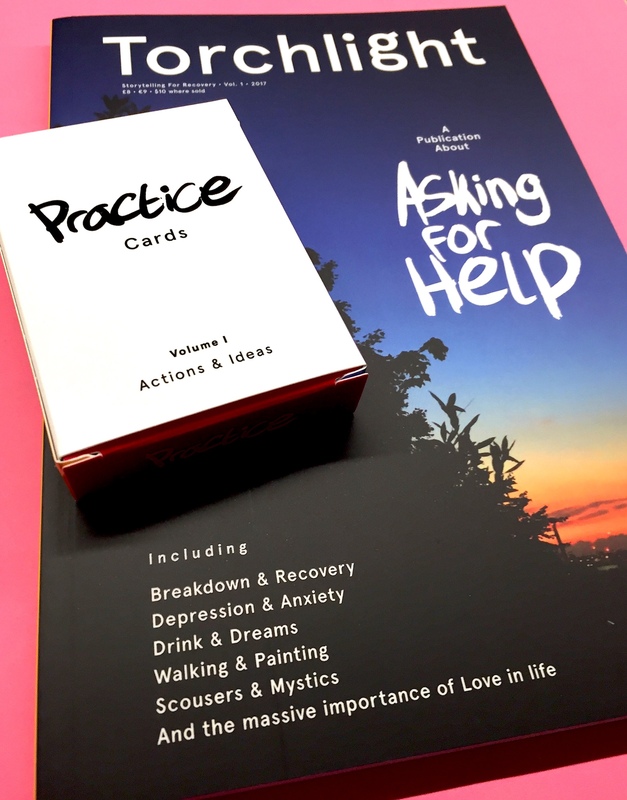 Torchlight is accompanied by a pack of Practice Cards I made, that contain 55 suggestions for dealing with anxiety and depression, or how to live in recovery. They show actions, physical things to do, ways to bring the mind back into harmony with the body, as well as ideas: things to meditate on, visualise and imagine. I encourage people to shuffle the pack, pick two cards, try to do one thing every day, and build positive daily habits. It’s a way of making a game out of getting better. The cards include many of the things that helped me get through the worst of this episode. They form a recovery system that I cobbled together from fitness, spirituality and philosophy and plain old common sense. From what I hear from people I’ve given packs to, they’re already helping others. These days we need more ways to talk about and deal with mental illness, individually and collectively. It seems that most of us have either suffered in some way, or we’re close to someone who’s also dealing with the dark stuff. I’d argue that we can build and innovate new ‘technologies for talking’ – social protocols, ways of sharing, methods of connecting. But even more simply, it’s about something else too: encouraging others to ask for help when they need it, and ideally long before.